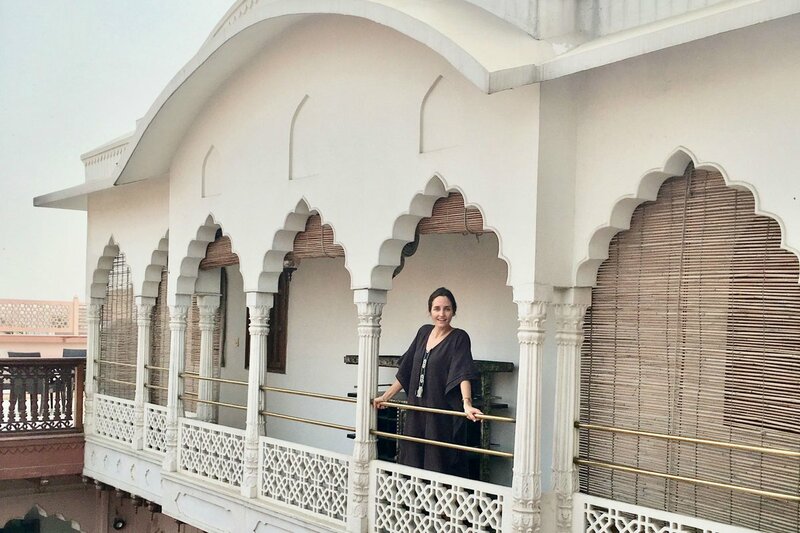 Designer Katie McClure at Dharampura Haveli in Delhi. All photos courtesy of Katie McClure. 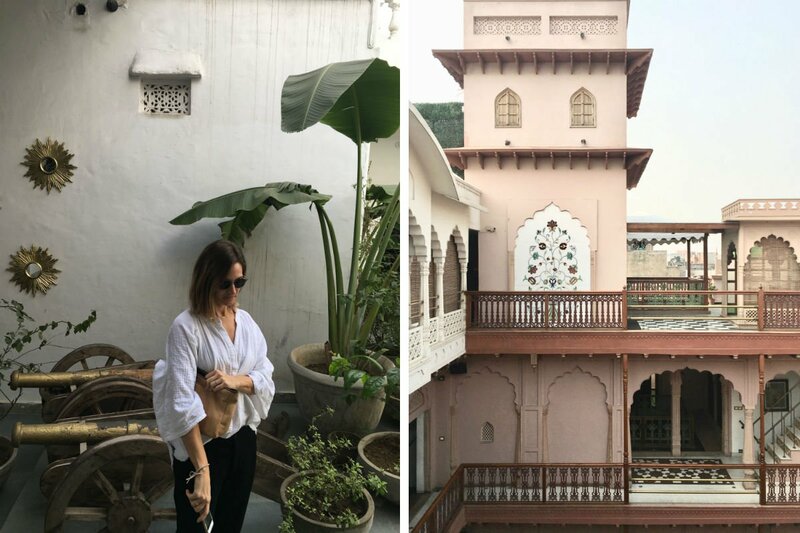 Katie McClure, one of two sisters behind the dreamy resort and caftan line MIRTH, offers some excellent traveler tips and tricks for getting around Delhi, India. DELHI, India - Twice a year my sister and I come to Delhi to work on our caftan and resort wear line, . 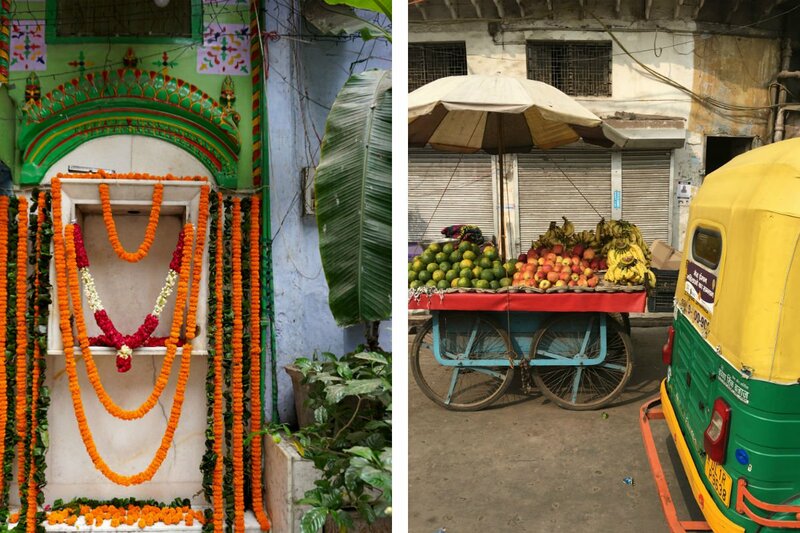 It’s fitting because our inspiration to start the brand came from our trips to India. Days are typically full of workshop visits and meetings, but we somehow manage to get out and explore. Leisure time is important, right? Before arriving in Delhi, it’s always smart to plan ahead for an airport pick-up. The first exit out of the terminal is exciting but overwhelming, and you'll appreciate a driver to guide you through the crowds. I also stock up on cash before heading into the city, put hand wipes and a phone charger in my bag, and take out a bandana to cover my face when the polluted air is too much. The first thing to understand about Delhi is the traffic. The city is massive and getting around takes time. A drive to dinner can take two hours despite the map telling you 30 minutes, so plan well. Feast your eyes on the colorful bustle of the city around you and even long drives will go by fast. An alternative to the crazy traffic is the subway system. The subways are spotless, cheap, and feature women-only cars. The only downside is they are not extensive enough to rely on. Although I feel safe in Delhi, I always try to keep my wits about me, and am particularly careful after dark. Left: Katie's sister Erin in Serendipity. Right: Dharampura Haveli. Since our team and suppliers are based in South Delhi, it saves us hours in the car each day to stay close by, so we call Aerocity home. Further from the center of the city, it's a great stopover for your first night in town if you arrive late in the evening. Don't be deterred by the airport hotels — they are actually luxurious, welcoming, and full of delicious food. The new , where I usually stay, is set up for business (by that, I mean they provide unlimited bowls of gummy candy at the work tables in the lobby) and is full of creative design details. Finding a spot at the communal gin bar and sipping on one of 40 house-infused gins has become a nightly ritual. The fleet of brightly colored Ambassador cars is a fun way to sightsee for an afternoon. Staying at an Aerocity hotel will also make your journey home more bearable. Many international flights leave between 11 p.m. and 4 a.m., so bring your luggage to the Andaz or Marriott and check it, have a long dinner, or book a midnight massage. It's only a ten-minute drive to the airport and you will arrive happy and sleepy for your flight. And don't forget to stock up on snacks at the basement market in the department store. There are very limited food options inside the airport. hotel makes you feel like you're stepping into the 1930s (when it was built), and is arguably one of the grandest spots in the city. It can be a bit touristy, but you should at least go for a lime soda on the terrace, high tea in the atrium, or a thali at . After tea, you can browse vendors at the , in front of the hotel. I find it a bit repetitive but have spotted some legit antique brass lassi cups and other unique finds. Also on my list of hotels is , a charming jewel of a boutique hotel run by a French expat. It's nearly always booked when I try to stay there, so I recommend planning in advance. Although you should take caution when it comes to eating meat and uncooked vegetables in India, the food is incredible. Probiotics and activated charcoal will help those unaccustomed to the rich cuisine, which is the case with nearly every foreigner. Lucky for us, our doting colleagues usually bring home-cooked kichri for our lunch each day. Kichri is like chicken soup for the body and soul. Most chefs will make it for you, even if it's not on the menu. Extravagant dining in over-the-top settings is something you must experience when you visit Delhi. If you can't get a reservation at , the new and glittering restaurant at the Roseate House is Indian fine dining at its best. We love the modern twist on familiar dishes. The tasting menu at is something we highly recommend you try at least once. The new and bigger location in the makes scoring a reservation much easier. On my last trip to Delhi, I was thrilled to discover , an addition to Chani Chowk, the shopping area in Old City. The gorgeous renovated haveli is located in the center of the bustling city and will take your Instagram to the next level. Have lunch here after visiting the and jaw-dropping . It's the perfect respite, and you can try street food and chaat (India's national snack) from the comfort of the courtyard. Be sure to have a drink on the rooftop for a spectacular 360-degree view. Left: Chandi Chowk courtyard. Right: A colorful street corner. There are more jaw-dropping monuments in Delhi than you likely have time for, so plan on seeing a few and don't try to pack in too much. It's all about rotating between activities and rest throughout the day. 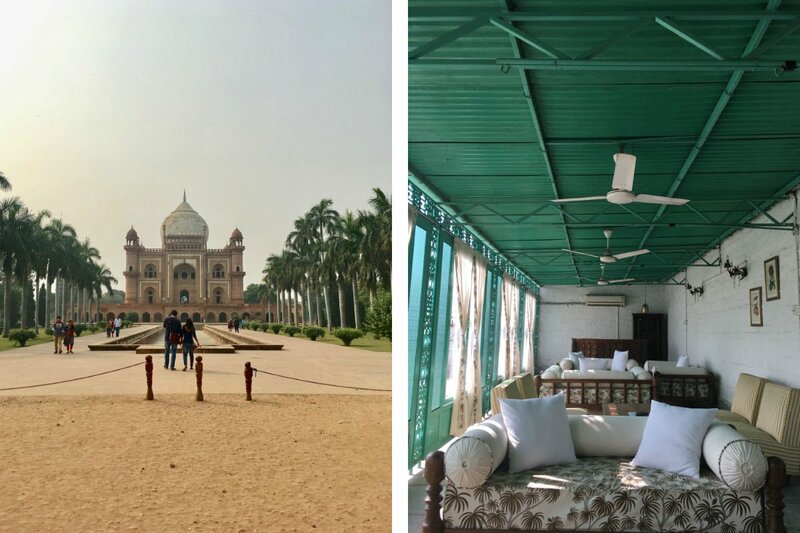 Some of our favorite sites include and , the predecessor to the Taj Mahal. The Red Fort and Jama Masjid, both in Chandi Chowk, are gorgeous and worth a wander. If it's your first time to India, consider a guide to help you navigate and explain the rich history. Delhi-ites aren't early risers, so go first thing in the morning for a magical experience and to have the sites to yourself. Old Delhi is quite conservative, crowded, and dizzying, so take care and avoid wandering alone if you can. Hire a tuk tuk to navigate the tiny alleys, and try to duck into some of the hidden courtyards that blanket the area. Chandi Chowk is divided into sections based on what they sell. We often go to for trim sourcing. If the weather is nice, walking the Rajpath (the broad street between the Presidential Palace and India Gate) is a nice way to get outside and people-watch. I've always wanted to rent one of the colorful little boats there. Next trip, the is at the top of my list. I hear it's lovely. 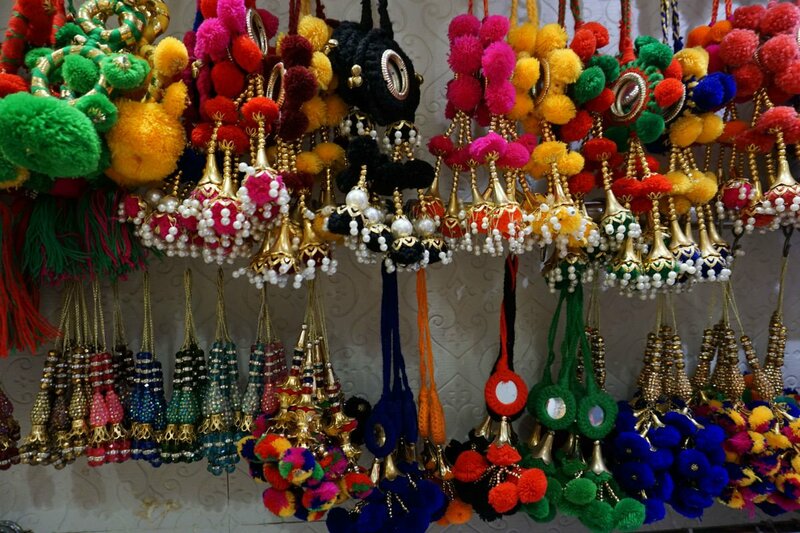 Colorful tassels at Kinari Bazaar. Left: Safdarjungs Tomb. Right: Daybeds at Serendipity. My top pick for shopping is , past beautiful homes just a bit outside town in what feels like a small village. Push open the old, heavy wooden doors and wander the multi-level shop for hours. You will feel like a guest in a gorgeous haveli home as you pick through block-printed PJs, antique knick-knacks, and well-curated home goods. 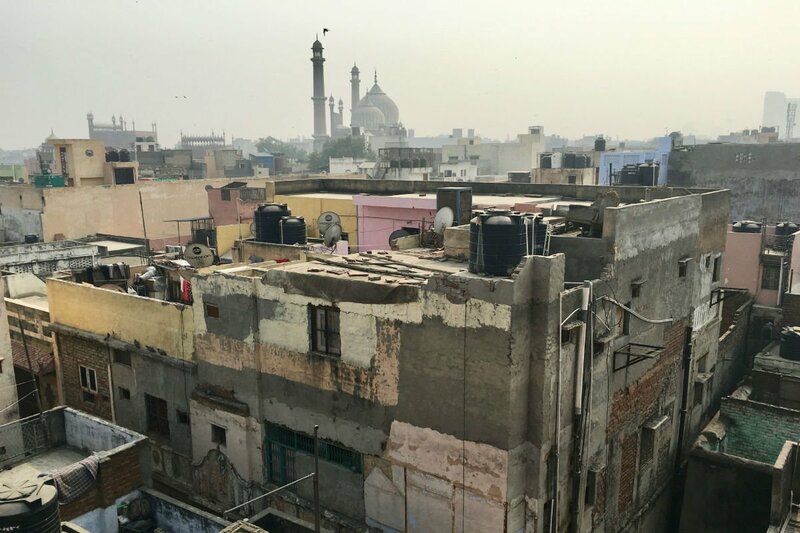 Stay for a snack and masala chai on the rooftop before heading back to town. Their dreamy is worth following, especially if you're a textile lover. Meherchand Market on Lodi Road is a good area for browsing several shops and has a nice array of indie stores. I always pop into , a modern concept store with simple, high-quality Indian products like airy cotton blouses and dresses, hand-loomed striped napkins, marble kitchenware, and hand-stitched pillows. is full of block-printed everything. This is where I go to stock up on robes, blankets, notebooks, and baby gifts. Leather goods store is also worth a stop. Visit Khan Market for the ease of getting everything you need in one place. Many Indian designers have shops here, being a favorite. High Street stores include for home goods, for jewelry, and for a refreshing rosewater face spray. There are also plenty of rooftop restaurants to choose from. If you want to bring back fabrics, in Nehru Place has the biggest assortment. I use , based in Delhi, for car service all over India. No matter how remote our destination, Rajendra always has a car for us, even at the last minute. There's never been a hiccup and we find them to be impeccably professional and reliable. Once you're tuckered out from Delhi, take the short flight to Dehradun for a stay at the spectacular wellness retreat . You will never want to leave. Katie McClure is the co-founder of MIRTH, a line of caftans and resortwear designed with artisan textiles from India. You can follow her on . She travels for the local markets, coffee culture, and fuel for creativity.